When I took down all the Christmas decor, my poor porch was left so plain, it needed some attention. I was cleaning up outside, trying to get all the pollen and leaves off the porch, so I thought I would give it a little spruce up at the same time. I shopped the house for a few of my favorite things. 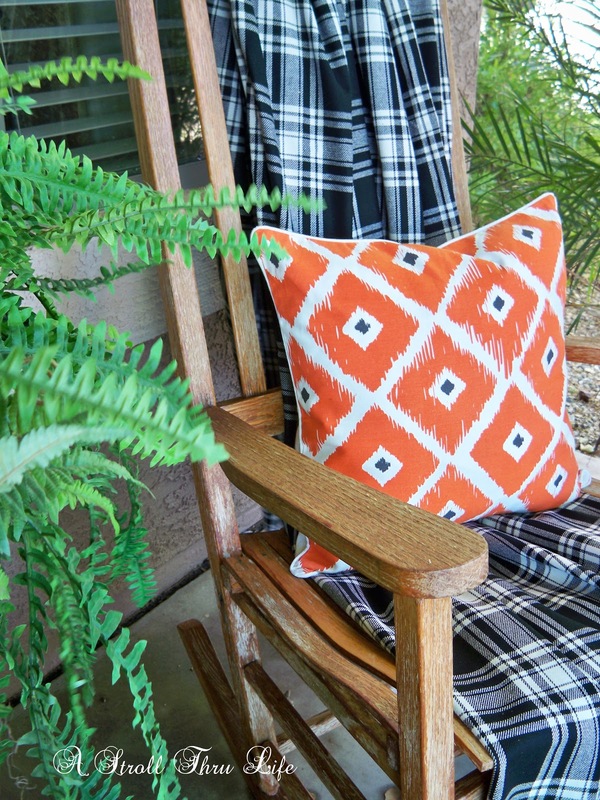 Tangerine and Orange are my new favorite colors, so of course I think it is a happy and inviting color for the porch. This is the hat I grab everyday as I take my morning walk. A cute orange ribbon spruces it up. 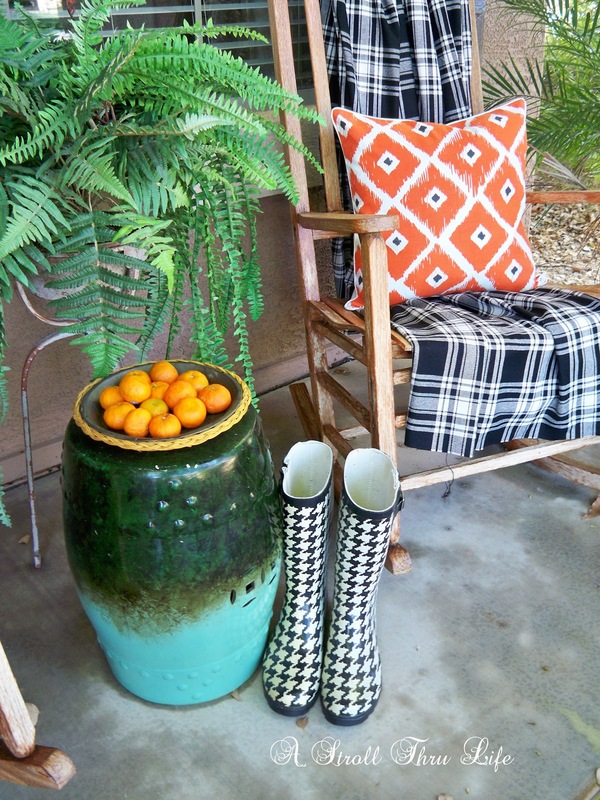 I thought this pretty pillow worked well with the plaid and of course I think every space should have a little black and white, don't you? If you don't have a throw in the colors you want, find some fabric you love and just use it. I've had this black and white plaid for years and never made anything out of it, so it became the perfect throw and it's light enough if there is a chill in the air to cover up. 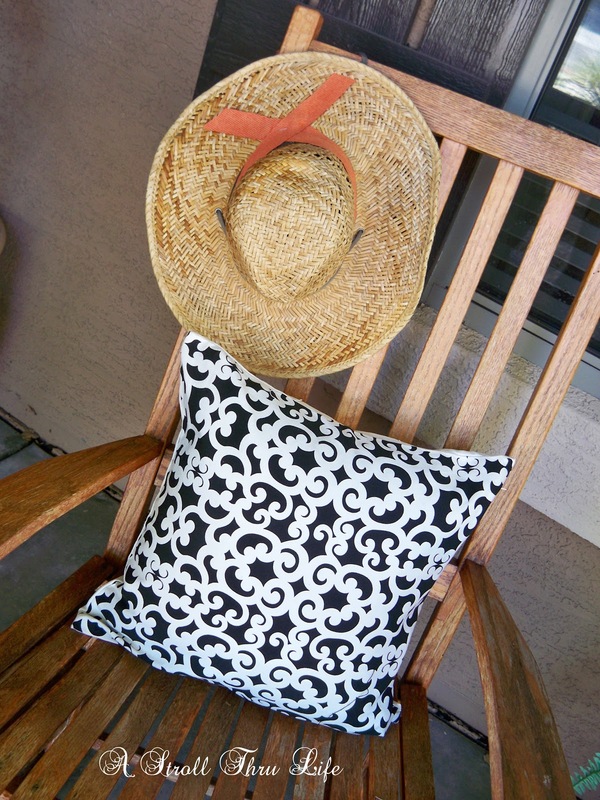 Hobby Lobby also has some really pretty pillow covers in outdoor fabrics. These were $6.95 each. My rain boots are perfect when I start to hose off the front of the house and work in the yard. I think they look fabulous sitting next to the chair and garden stool. That's the same stool I painted a few years ago, it has held up perfectly. Not one single scratch. You can see how I painted it here. Much better, this looks like a happy place to be. 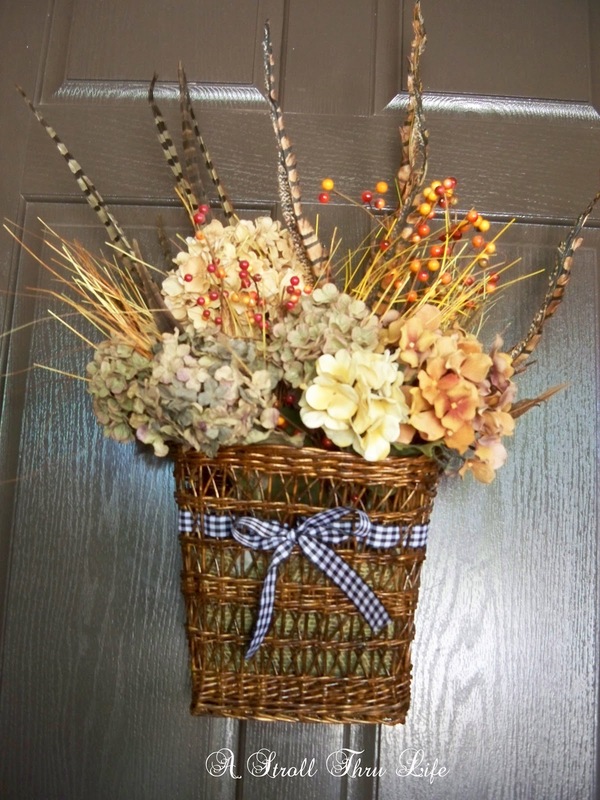 I re-used the basket that was on the breakfast room wall before I did that makeover on the front door. A great place to sit and have a glass of tea after working in the yard or taking a walk, and I think it says "welcome". How about you, do you have a favorite spot to sit and relax and enjoy the outdoors? Marty, I love those pillow covers! Thanks for the HL tip. I dont have a HL close, but at that price, it's worth the trip. Your porch looks very inviting. 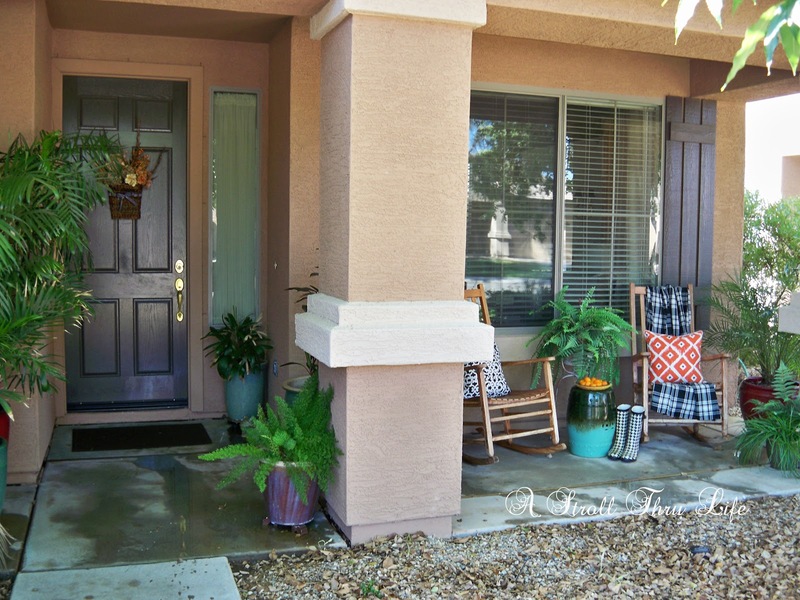 Marty your front porch looks so pretty...love all the greenery and that pretty basket on your front door! Oh, Marty, how beautiful and welcoming. Pairing black and tangerine was a stroke of genius--the colors are so fresh and pretty together. I'm smitten by your houndstooth boots! Marty you have inspired me to change mine. I've been going to do it for ages. Yours looks really nice. How inviting, Marty. I'd love to sit in those rockers! And I adore your boots - too cute! Such pretty details. 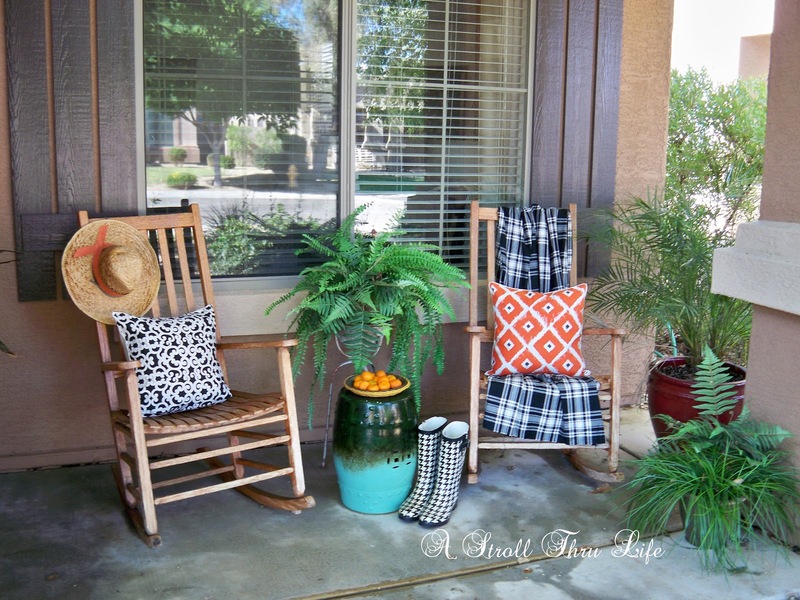 Love the color pops and how inviting the porch looks. Thank you for sharing! SUCH a lovely space Marty! Looks so fun and cheerful. The pops of orange colors that you used is beautiful next to the black and white. Lovely! It looks so great Marty! I love the black and white pillow too. Your spring porch is lovely. We have an adirondack on our front porch, but rarely sit there. Either we sit and relax in the garden or head out to the beach so the dog can dig in the sand while we watch the waves. I love the pops of orange Marty! So inviting! 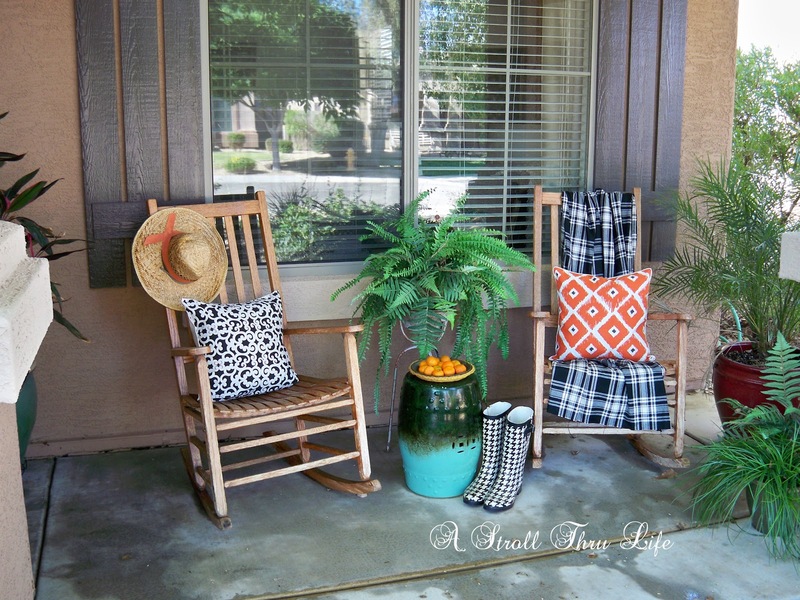 Your front porch is so inviting with the rockers and all your colorful additions! I'm sure it is pure delight to sit there and sip iced tea. Thanks for your clever ideas! Just loving the color combo. Hope I find some new darlings too in CT, South Africa. Very inviting and pretty out on your porch. 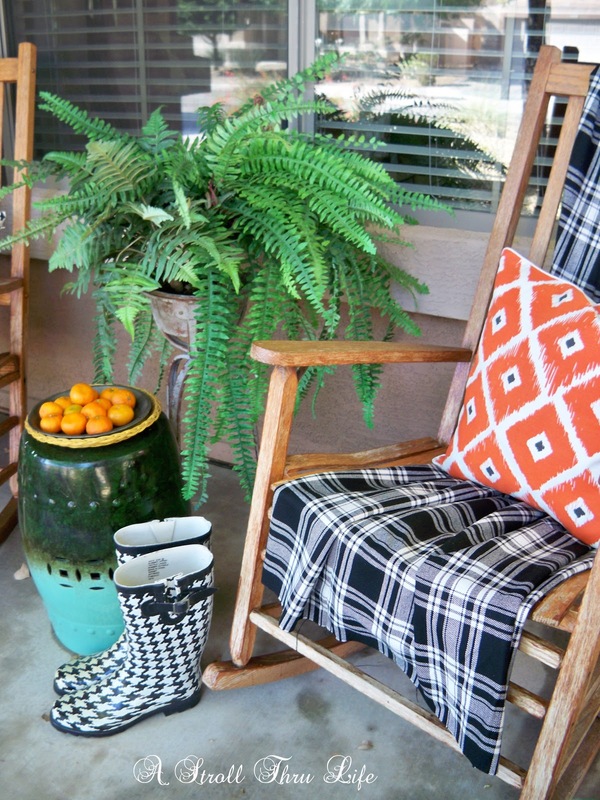 Love the basket on the front door and the cute rain boots. So cute. Your porch looks beautiful, Marty! Marty, Your porch is very pretty and I love the pop of orange. Thank you for joining the Share Your Style party.